Thanks to Susan Anderson for blogging about my new Regia Colorations sock yarn. You can read about it here. 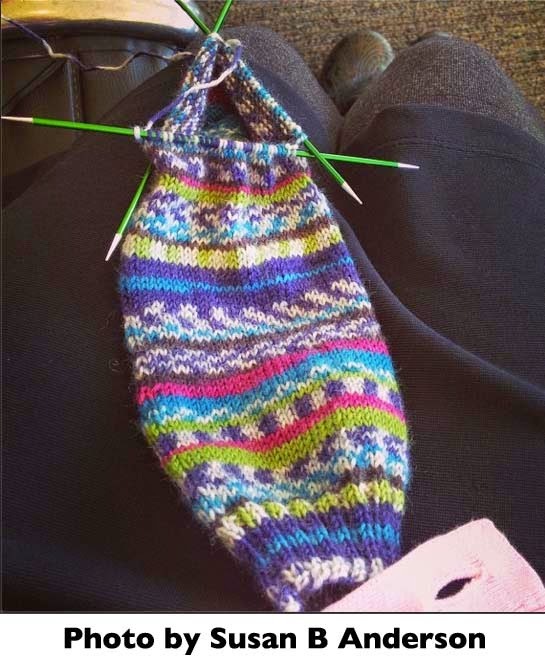 Here is a photo of Susan's sock in progress from her Instagram feed. Here is one of her finished socks on a sock blocker. The color is 3311Midnight Sky. There are six colors of Colorations - all with a blip of natural making up a "faux Fair Isle." Very fun knitting. See this post for some backstory and all the colors. I also have a sock yarn line called Garden Effects from Regia. Check it out here. Regia Sock Yarns are carried in many LYS so make sure you check with your local store if you are lucky enough to have one. You can find it on-line at Websters and at Webs. Susan is one of the most amazing knitters I know. She has stacks of handknit socks, sweaters and knitting books that she has authored. And beyond that, she is one of the kindest people on the planet. Thank you Susan! Kristin, this self-striping yarn has got a wonderful range of colors that sort of "step on the stage" when their row is called. I note that Midnight Sky is now on back order at Webs. Other wonderful color choices are still available. Since the temperatures are dipping, and sun hours are shortening, it's definitely time now to knit some socks. Susan's sock pattern looks intriguing, too. I have my own tried and true basic pattern from Ann Budd's Knitting Socks book that de-mystified turning the heel for me, but it's always great to find another source. 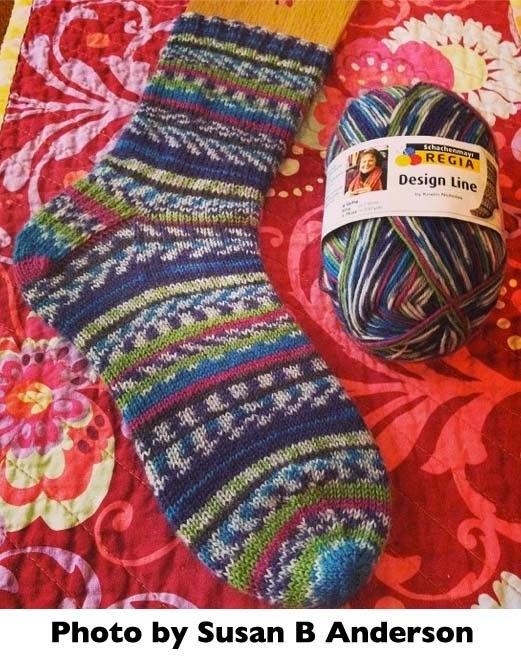 I was very inspired to get some of this yarn when I saw how lovely it looked on Susan's socks! I was happy to receive my "summer fruits" yarn from Webs last weekend! I can't wait to see how it works up!